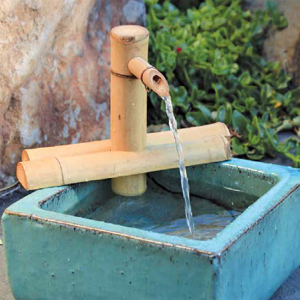 These genuine bamboo fountain kits lend themselves to infinite design possibilities. Easily create simple and elegant water gardens using a variety of natural elements, including plants, decorative stones, slate and other ornaments. The flat bamboo base gives this style greater stability. Use this size out in the garden, patio or as an indoor accent. Fits 6in to 15in diameter bowls. Kit includes 7-inch adjustable bamboo spout, tubing, and pump. Bowls sold separately. The flat bamboo base gives this style greater stability. This model is the perfect scale for most garden scenes, making it especially versatile. Fits 10in to 20in diameter bowls. 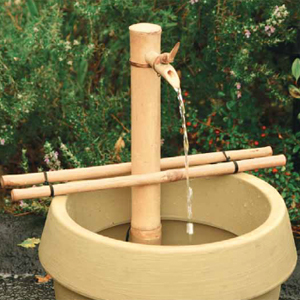 Kit includes 12-inch adjustable bamboo spout, tubing, and pump. Bowls sold separately. The 12-Inch Three-Arm Spout produces a deep, rich sound from its wide water flow. This fountain kit provides a classic look and sound. Fits 10in to 20in diameter bowls. Kit includes 12-inch Three Arm bamboo spout, tubing, and pump. Bowls sold separately. 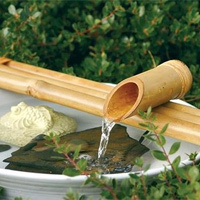 People love the presentation of the 18inch Adjustable Bamboo Fountain Kit. Its large diameter upright bamboo pole contrasts nicely with the two delicate small diameter bamboo branches. This fountain is normally used in a garden, as the scale is right for a larger outdoor setting. Fits bowls 15in to 30in diameter. Kit includes 18-inch Adjustable Bamboo spout, tubing, and pump. Bowl sold separately. 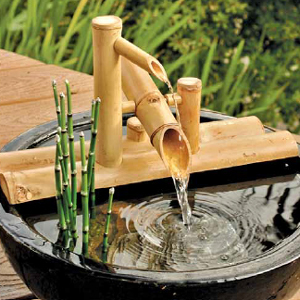 This unique fountain kit features a rocking bamboo spout suspended by bamboo arms. 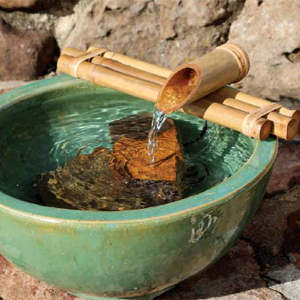 As the spout fills the rocking bamboo spout, it tips the water into the bowl. Creates a melodic, gentle clunking sound said to chase deer from your yard. Fits bowls 12in to 24in in diameter. 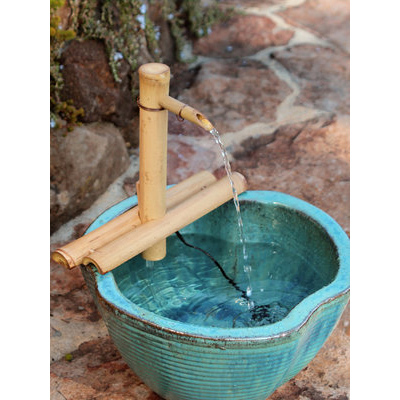 Bamboo kit measures 16in l x 5in w x 7.5in t. Kit includes Rocking Arm Bamboo fountain, tubing, and pump. Bowl sold separately. © 2019 Urban Garden and Home, Inc. All Rights Reserved.